Hedley in Montreal or Quebec City? Inform me about the next events for Hedley. Enroll yourself to our priority waiting list for Hedley to be alerted when new tickets are available. Filling this form doesn't engage you to any purchase. The Canadian pop rock band Hedley will stop by the Bell Centre in Montreal on February 21st, 2018 ! Hedley released their sixth studio album Hello last November and will be playing their hits and songs from this new record during this new tour entitled #Hello World Tour. 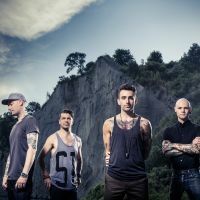 One of the most successful touring acts of the country in recent years, Hedley has sold more than 500 000 tickets for shows in Canadian arenas since 2010, including over 150 000 tickets sold for their latest tour The Wild Life Tour.